During this month we should strive to deepen our knowledge and love of her through prayer, especially the rosary, the veneration of her images, the reading of Sacred Scripture, the study of the Church’s teachings and the great Marian theologians. The Bible tells us not to despise prophecy. Therefore, we should also be open to the Marian apparitions that the Church tells us are worthy of our belief. In our catechesis about the family we have to insist that Mary, as St. John Paul underlines in Evangelium vitae, is truly the Mother of God, the Theotokos, in whose motherhood the vocation to motherhood bestowed by God on every woman is raised to its highest level (103). On the Cross, Jesus made Mary the mother of all, by giving her as mother to St. John the Apostle. This incredible gift is fully actualized by the ones who receive in baptism the magnificent status of adopted children of God and thus become incorporated into His divine family. At the same time her motherly heart is particularly concerned for the ones who have not received baptism through no fault of their own. As a consequence, Mary’s motherly heart has particular concern for the babies in the womb at risk of abortion. Her heart is also filled with compassion toward those children born in irregular situations and who are deprived of a proper family formed by a man and a woman committed to one another in a permanent and faithful union. Parents are the primary educators of their children. Mary and Joseph certainly gave Jesus an excellent education. Mary herself likely received an excellent education in the Temple. The Church celebrates the Feast of the Presentation of Mary in the Temple on November 21. The Fathers of the Church believe that she received a special education there to prepare her for her eventual role as the Mother of the Redeemer. In the Orthodox Church, Saints Joachim and Anna, the parents of the Blessed Virgin Mary, are considered Patron Saints of a Pious Education for this reason. Since life and family are under such a severe attack in our secularized society, we pray to the Blessed Mother for protection of life and family, knowing that she is the intercessor of all graces. St. Bernard of Clairvaux stated: “God has willed that we should have nothing which would not pass through the hands of Mary” (Hom. III in vig. nativit., n. 10, PL 183, 100). Through her intercession the hour of Christ was moved forward, and water was transformed into wine at the wedding in Cana. In the protection of the Blessed Virgin we place our total confidence and hope. Inspired by the Memorare of St. Bernard we express our assurance that if we seek her protection, implore her help and pray for her intercession we will never be left unaided. 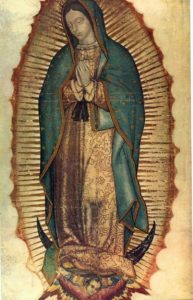 Remember, O most gracious Virgin Mary, that never was it known that anyone who fled to thy protection, implored thy help, or sought thy intercession was left unaided. Inspired by this confidence, I fly unto thee, O Virgin of Virgins, my mother. To thee do I come; before thee I kneel, sinful and sorrowful. O Mother of the Word Incarnate, despise not my petitions but in thy mercy hear and answer me. Amen. Through our prayer to the Blessed Mother for protection of life and family, may our culture become a Culture of Life. This writing was so informative and it helped to understand questions I had have. Praying the rosary and praying the “hail Mary” prayer is very miraculous powerful. Your prayers get answered when you pray humbly and devotedly. I am a young woman who can tell you, Mary is our mama who will protect you from others. Do not be anxious. Be happy and confident for the guardians angels in heaven are protecting you when you ask for mama Mary’s intercession. I am taking a nursing course and I ordered a book from Amazon in Monday afternoon. When I was laying down in bed Monday’s night, I checked the Amazon app and I had a notification saying that they were sorry but if I did not got my book by Thursday, to give them a call. I started getting anxious and thinking that Thursday was a bit late to get the book. I got up from laying down, and pray hail Mary’s and Our Father prayers asking that for this particular prayer. I do not remember my exact words. Tuesday morning, I got my book. Praying the rosary and invoking mother of Jesus name is very miraculous powerful. God bless.